the ultimate camping with kids reading list! Fall is a great time for a camping trip. Here in the South, mid to late summer can be just a little too hot and humid for prolonged time outdoors, so when the first crisp and cool autumn weekend hits, we throw our old orange tent and sleeping bags into the car and go! Here is a list of some of the best books to take along on your next trek into nature with the kiddos. We can't wait to take this on our camp out. It is chock full of skills like how to make a kindling carrier out of a sweatshirt, how to properly handle a pocket knife, and (our favorite that we are most definitely going to try) how to make a campfire reflection oven using aluminum roasting pans. 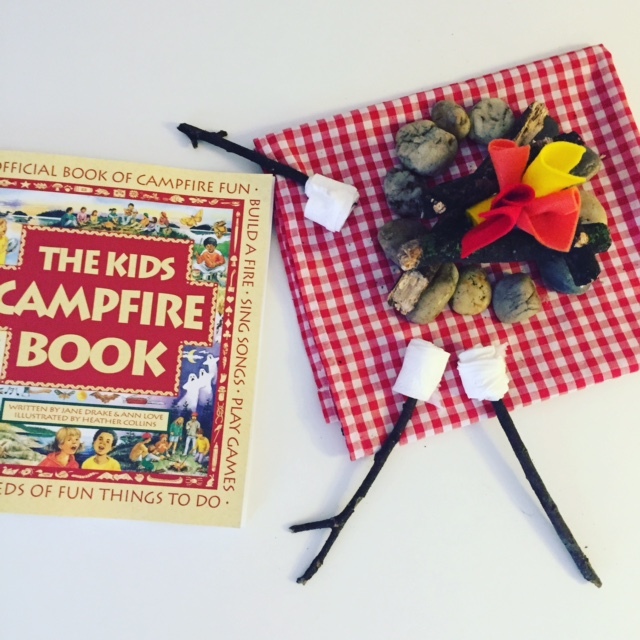 The Kids Campfire Book also has enough fun games and sing-a-longs to remind my kids that not all fun comes from a screen! ages: 5+ for the fire skills, although younger ones could definitely enjoy the games and songs sections. My nine year old loves to identify wildlife and plants when we go out to the woods. This guide has almost three hundred pages detailing different species of animals and plants, what they eat, where they live, and more. It also has several blank pages for young wild life watchers to catalog what they have seen. One of the best moments during camping can be encountering the creatures that call your camping spot home on a more permanent basis. Once on a camping trip, we were woken up by the sound of coyotes howling at the moon. Listening to them gave us this sensation of excitement and maybe a little fear. They were definitely far far away from our little tent, but just the idea that we were sharing the night with other creatures was such an experience. In Marino's book, Possum and Skunk and their friends are hiding because they have heard that the forest is filled with animals who only come out at night. Night animals sound scary too them! It isn't until the end of the book that they realize - they are night animals! Hope you enjoyed this literary romp through the forest! What camping reads would you add to the list?